The retail sector has changed out of all recognition, with large shopping centres becoming mixed-use destinations offering everything you could possibly want to purchase, eat, drink or be entertained by. And that makes them extremely attractive places for another kind of visitor and although, mercifully, the UK has not experienced a terrorist attack in a shopping centre, the 2013 assault on the Westgate Shopping Centre in Nairobi, Nigeria, which killed 67 and injured 175 others, is a stark reminder that an ideal target for the terrorist is a crowded place. It hasn’t been for want of trying. In 2004, Operation Crevice disrupted a plot to detonate explosives at, among other targets, the Bluewater shopping centre near Dartford, Kent. Currently, an alleged Al Qaeda bomber is on trial in New York charged with plotting to bomb a Manchester shopping centre. In November 2014, to coincide with the UK’s counterterrorism week, police forces in the West Midlands, Liverpool and Manchester – and others – warned of the risks to shopping centres. In August, the UK raised its threat level from substantial to severe, the second highest level. Also last November, Home Secretary Theresa May said that terrorists have sought to kill thousands in around 40 plots targeting the UK since the July 7 attacks on London nearly ten years ago. She also added that in a speech in central London, that more than 750 people have been arrested for terrorism-related offences since April 2010, with 212 charged and 148 successfully prosecuted. In May last year, the Home Affairs Select Committee said that police should contact every shopping centre with guidance from the British Council of Shopping Centres, including a requirement for shops to have a security plan and to test it. The Council produced the guide in partnership with the National Counter Terrorism Security Office. But it’s not just about vigilance and having a fast response to any attack. It’s about having both passive and active measures in place to contain an explosive incident. 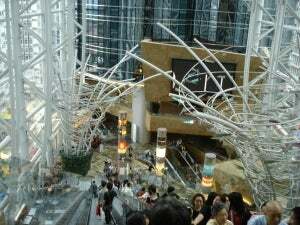 We’ve supplied our systems worldwide, most recently for retail and leisure regeneration schemes in Hong Kong and Beirut. Our glazing systems are primarily, of course, to protect against fire and smoke. But we’ve also tested one of our glazed assemblies against a lorry bomb, generally agreed to be some 500kg of TNT explosive. We also then tested the same assembly against a car bomb – both tests were successful. You can watch videos of our systems being tested against car bomb, lorry bomb and ballistic attack from our website. The importance of those tests is that glass fragments kill more people in an attack in an urban area than the explosion itself. Keeping the glass intact in its framing system is a potential lifesaver. The aesthetic advantages of glass are obvious, and how glass can transform the ambience and functionality of interior space is now well understood. The challenge for us is to now keep pace with architectural evolution – from providing unrivalled performance against fire, or acoustic and weather performance, to combating terrorist attack. That last challenge is perhaps the biggest one that we’ve successfully met, underlining our system’s performance against explosive risks. In today’s uncertain world, designing in safety has become an integral part of retail therapy because, as we now know, there are people out there who would do us harm.